A lot of parents have no clue about when they should be taking their children to the dentist so that they can have their first dental checkup. What dentists actually recommend is for parents to bring their kids to the dentist as soon as the first tooth erupts. Some dental professionals also recommend that you take your child to their dentist before their first birthday. Although the first tooth will most likely be in pristine condition when it first appears, the dentist needs to see it personally so that he or she can assess its positioning. 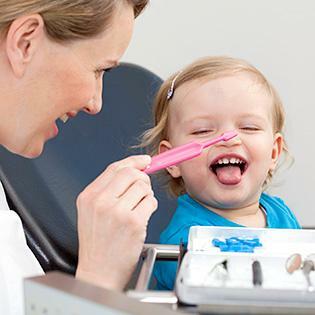 During your child’s first dental checkup, the dentist can also help guide you so that you will know exactly how to take care of your child’s teeth. By teaching you the basics of proper oral hygiene, the dentist can help you to make sure that your child gets healthy and shiny white teeth while he or she cannot brush his or her own teeth yet. It is very important for parents to understand that their baby’s teeth can develop cavities as soon as it appears. The primary objective of the dentist during the first visit is to try and see how well your child’s teeth are developing as well as to check your child’s mouth for the presence of any problems. The dentist will try to check whether the tooth is having signs of tooth decay or if your child has any injuries inside his or her mouth. This is also the perfect time for parents to ask the dentist how they can help their child manage their teething problems. Parents can also ask for help or professional advice on how they can make their baby stop thumb sucking or using the pacifier. When scheduling your child’s first dental checkup, make sure that your appointment is not during his or her naptime. You can set the appointment in the morning so your child will still be playful and energetic. You can also tell your child that he or she will have tons of fun riding on the dentist’s chair. Make sure that your child is included in your dental insurance plan and always feed your child with a light meal before seeing the dentist. Try not to give your child snacks while he or she is in the waiting room and try to calm yourself down. This is because your child might be able to pick up on your emotions and he or she will also get anxious if you are. Avoid using the dental checkup as a punishment or reward so that your child will slowly understand its true purpose and importance. Make your child feel that the checkup is going to be fun and exciting. Let your child know that it is going to be a great experience meeting the dentist, and try to talk to your child about the importance of having your teeth checked. You can also practice with your child how to open and close his or her mouth so that your child will feel comfortable when the dentist asks your child to do it during the checkup. You can also opt to use story books and videos to help your child feel more comfortable when it comes to seeing the dentist. If your child gets upset during the checkup, let your child stay calm and let the dentist lead with the conversation. Trust your dentist and let the dentist turn the situation for the better. Let the dentist work with your child so that he or she will be able to give your baby a thorough checkup or the best possible treatment if necessary. Making an active effort to keep your child’s teeth in good condition today can have a significant impact on his or her oral health later on in life.